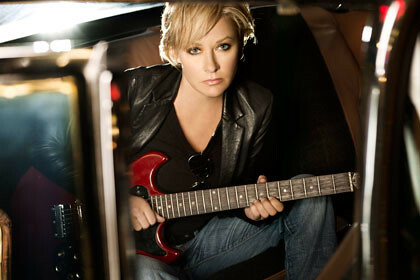 Listening Room: Shelby Lynne - "Loser Dreamer"
My wife and I are big fans of the show N.C.I.S. and one of the things we like best about it is main character Gibbs' list of 51 rules. They aren't exactly written down in one place where you can learn them all. Gibbs teaches, you learn; that's how it works. I have a list of my own where music is concerned. There are rules, important concepts, and universal truths of music and one of these is what we'll call the Flux Capacitor property of music; the power of music to transport listeners to places real or imagined, anywhere in time going forward-back or completely off the grid. When a song harnesses that potent power, I'm likely to lose my own concept of time because I'm going to listen to that song and only that song 10, 15, 20 times in a row. I get lost in time and space and in the alternate geography and universe I've been carried to. Being directionally challenged (thanks, Mom), lost is not an unusual feeling for me. Lost can feel lonely. Lost can feel desolate. Being a huge dork, I know lonely and desolate. Lost in music can feel that way but it's usually different than being lost in life or traffic or in the flood (thanks, Bruce). Lost is usually a stressful feeling because there's a struggle to bring order or logic to a feeling of chaos. You usually get lost when you're trying to find something. You have to solve the puzzle to make the psychic pain stop. Music lost isn't like that. I get whisked away without my knowledge or permission when I get lost in music but rather than feeling panic or stress, I feel a sense of detached calm and serenity. It's surprise in the best sense. I don't know where I am but I don't want to leave and can't think of anywhere better to be so I sit down and stay awhile. I know this has been a really long setup but if you've stayed with me this long, I am about to give you the payoff. I'm about to hand you a ticket to somewhere you've never been, yet somewhere you feel you've lived your whole life. I'm giving you a map so you can find me in music lost. Don't worry… you don't have to sit next to me. We can be lost alone together. The Flux Capacitor is pretty cool. I started thumbing through my iPod this morning and stumbled on Shelby Lynne's Tears, Lies & Alibis record from 2010 and my day stopped within the first few gentle bars of acoustic guitar that open "Loser Dreamer." There are millions of ways to get lost but one that works wonders on me is a voice. Boys and girls, Shelby Lynne has a lost voice. She can sound so completely lost when she sings and the power and emotion in her ability to sing can knock me off course for hours and sometimes days. Shelby Lynne is lost for me. We can talk about lyrics because they're great and we can try and figure out what the song might mean but that's not really the point when you get lost. You don't solve for "x," you drink "x" and swallow it whole and allow yourself to be one with it. You surrender and release yourself to it. The story unfolds in front of you. Maybe it's the story from the song in a literal, chronological sense or it could be the feeling and spirit of the song dancing in front of you without revealing its secrets. "Loser Dreamer" is a dreamer's paradise, gentle to the touch, soft with no sharp edges. It's gauzy and hazy but not slick. You can see the grain in the woods but never feel anything abrasive. A landscape begins to take form and shape. It feels tropical and rural, rustic and lush. It feels beautiful and serene yet a current of longing or twinge of regret adds clouds to the skyline. Is the sun rising or setting? Is it dawn or dusk? Lynne's voice carries you, supporting you without shouting, pushing, or propelling. She sings to you as ethereal rivulets of steel and electric guitar sway in the gentle breeze of intermittent harmonica gusts. He don't have nothing but time to dream on…"
… and you're lost once again. Buy this song and book your trip. Go somewhere exotic for a buck. Best deal in town.